Can I tell you a secret? I thought I wrote about this exhibit MONTHS ago. Yup, people keep laughing when I say it but I still feel like I’m closing out 2017 in a lot of ways. And yes, I know we are almost to the halfway point of 2018. Someone please tell me how that happened??? Either way, I am really excited that we didn’t miss this fantabulous exhibit when it happened in NYC over the winter. Let me tell you though, we almost did. I kept seeing people posting about this amazing show and kept saying I would take JustaBXgirl and then the year was quickly at an end and there was only a week left to the show. Enter Auntie E who just happened to book tickets all the way from her far off home in Philly. That got my hibernating self out the house. We ventured out in the FREEZING cold and made our way waaaaay downtown to where the exhibit was being held. Waited in line despite having tickets for a particular time and ventured into the greatness that was to be the Louis Vuitton Volez Voguez Voyagez show. This exhibit captured the essence of the Louis Vuitton brand completely. It was classic. It was bold. It was trendy. It was sophisticated. It was tacky. It was everything you expected and then about a hundred times more. There was something for everyone. You could feel like you were shopping to be a passenger on an ocean liner crossing the Atlantic and two minutes later feel like you were getting ready to watch a hip-hop concert. Back when I used to spend my hard earned money on luxury brands I wasn’t a HUGE Louis Vuitton fan. I think other than a pair of gorgeous boots that no longer truly fit my feet (thanks pregnancy foot growth) I might not own anything LV. Even still, the enormity of the brand was not lost on me. Walking through the exhibit reminded me of shopping at the LV store in Paris and sitting for tea. Walking through the rooms watching JustaBXgirl take in everything made me remember how blessed of a life I am honored to live. I watched my little girl not just walk through the exhibit but study the clothes. I watched her take in how the style and look of the brand developed over the years while still managing to hang on to the original feel. That’s my hope for her. I hope that as she grows she never loses the essence of who she truly is and yes, a luxury fashion brand reminded me of this. I was sad that the day we visited they had run out of the souvenir enamel pins they were giving away. I did get back prior to the end to get a pin to save for JustaBXgirl. I hope to be able to give it to her when she is older and it to serve as a reminder to her introduction to luxury. Did you catch the exhibit? 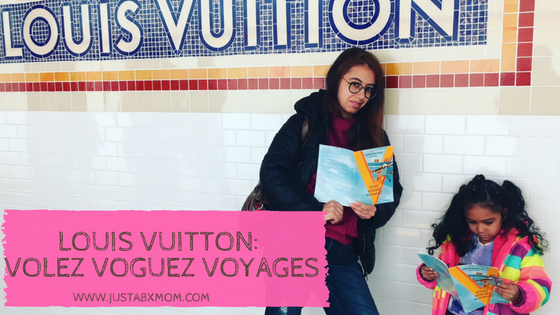 Are you a fan of Louis Vuitton?